Our purpose: Since 2000, training Central Asian believers as church planters, evangelists, pastors & elders, and ministry leaders. Our impact: Graduates have planted 30+ churches. Over 200 actively involved in church ministry in this largely forgotten and unreached region. Join our mailing list for student testimonies, mission practice updates, praise and prayer pointers, news on persecution etc. Use Give.Net from Stewardship to make an online donation. You can do this from www.give.net/Eurasian. Stewardship look after all the card handling and pass your gift on to us. We do not have access to or store your card details. Eurasian Ministries is registered with all of the major organisations such as CAF and Stewardship. When completing a voucher or making an online gift just ensure that it is payable to Eurasian Ministries UK Trust. You can transfer funds directly into our account using the details below. Please also send us an email to admin@eurasian-ministries.org so that we can administer your gift at our end. (It is a requirement that we can properly account for large donations that are later send overseas.) If you are a tax payer please don’t forget to complete and send us a gift aid declaration. Bank: Barclays Bank, 2, High Street, Chelmsford, Essex, CM1 1BG, United Kingdom. Account name: Eurasian Ministries UK Trust. Please send your cheque, payable to Eurasian Ministries, to our office in Tunbridge Wells: Eurasian Ministries, 28 Church Road, Tunbridge Wells, Kent, TN1 1JP. If you are a tax payer please don’t forget to complete and send us a gift aid declaration. Please contact us at admin@eurasian-ministries.org to discuss the most efficient means of making your gift. Curious to find out more about the stans’ – Uzbekistan, Azerbaijan, Tajikistan etc? Surprised to know that a mission college exists right in the centre of the Russian Federation? Sandwiched between Europe and Asia, but not firmly in either, this region has all but fallen from the gaze of the world and, more worryingly, the view of the Church. At 1/2 billion people, less than 1/2% of whom are Bible believing Christians – Central Asia is the least reached region of the world. But YOU can start to make a difference today – and one way you can do that is by holding a mission event at your church to raise awareness of Central Asia and the Eurasian Mission College. How much do you / or your church know about the Stans? In our experience, folk are fascinated to hear about the likes of Uzbekistan, Turkmenistan, Kazakhstan etc. and what God is doing in this largely forgotten region of the world. 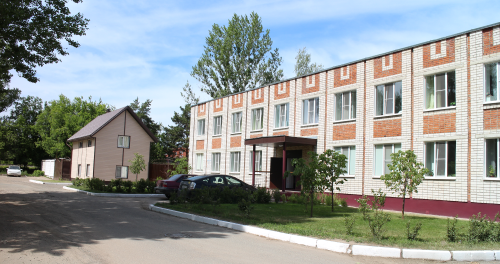 Eurasian Ministries supports a Bible college in Kazan Tatarstan which opened in September 2000. Past students have been actively involved in planting 30 churches across Central Asia. Over 200 graduates are actively involved in church ministries. The college equips Central Asian believers for gospel ministry back in their homeland, across Central Asia. How can I / our church best pray and support the Eurasian Mission College? Why not use your bible teaching gifts at the Eurasian Mission College? A range of UK pastors and bible teachers visit Kazan to teach for 1 or 2 week slots across a range of topics, bible books, and theology etc. Literally everyone who has taught at the college, is keen to teach again if their circumstances allow, so that must say something. They go to be a blessing, and yet in return they find the experience a rich blessing for them personally, and their home church. The college has an excellent team of translators. Some experience of cross cultural teaching is a bonus, although not essential. The college principal has a flexible approach and encourages UK visiting teachers to choose a subject they are passionate about, and often they choose topics that they have taught on, thus keeping the amount of study and preparation to a manageable level.